Frontline managers on the job, directly supervising workers and coordinating with other trades, our Leadership Team maintains the effectiveness and efficiency of our field staff. Our foremen stabilize each project with consistency and good judgment. Their role cannot be overstated with respect to being a critical component of our success. 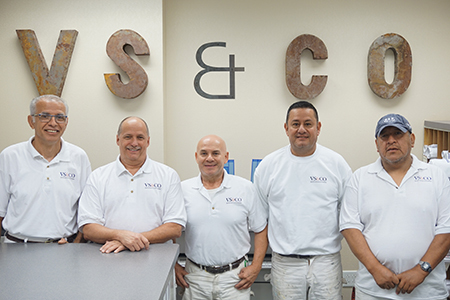 Key members of this group include, from left to right above: Angelo Baglione, Russell Malone, Jairo Cano, John Quintero and Hector Rojas. With well over 100 years of combined service explicitly with our firm, their loyalty and industry acumen is unparalleled. Beyond experience, our field supervisors possess management skills in problem solving, planning, estimating, safety supervision, scheduling, and controlling costs and resources. Their promise to each and every one of our customers is to professionally manage the people on our projects with uncompromising quality, value and expertise.